1/2 cup coconut flour, sifted. 1/2 cup almond meal or LSA. 125 g coconut oil, melted. 3/4 cups walnuts, roughly chopped. splash coconut water, add more if needed. Preheat oven to 190ºC / 375°F and lightly grease a muffin tray (or use cupcake papers). Grate the pumpkin (preferably with a food processor). Add the flour, almond meal, stevia, baking powder, vanilla powder and spices to the pumpkin. Whisk the eggs in a separate bowl, then use a wooden spoon to stir the eggs and coconut oil into the pumpkin mixture until the lumps are gone. Gently stir in the walnuts. Add coconut water, stirring, until the batter is thick. Spoon into the muffin tray and bake for 15-20 minutes. Serve warm or cold. 4 medium Swiss brown mushrooms. 50 g unsalted butter, plus extra for cooking. Preheat the oven to 200°C / 400°F. Lay the mushrooms on baking tray, stem-sides up, then spread one-quarter of the butter evenly over each. Season to taste with salt and pepper, top each mushroom with 1 sprig thyme and bake for 10 minutes. Crack eggs into bowl and stir lightly, so the yolks and whites break up a little. Swirl in cream and season with salt and pepper. Heat a small frying pan over medium heat and add a knob of butter. Once the butter has melted, increase the heat to medium–high and pour in eggs, distributing the mixture evenly. Drag a spatula or fork through from the sides of the pan to the middle, then cook until most of mixture is set, but still a little runny. Remove from heat. Add mascarpone to centre of omelette, then tilt pan and gently fold omelette in half. The egg mixture will continue to cook. 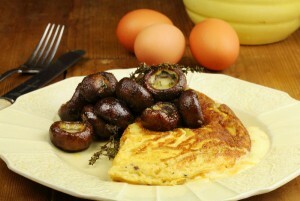 Loosen the base of the omelette with a spatula, then slide onto a warm plate and scatter with parsley. Serve with the baked mushrooms and wholegrain toast to the side. 1 bag unsalted nuts (almonds, cashews, macadamias or peanuts) preferably activated. Blend in a food processor until the mixture is smooth and creamy. Then store in an airtight container in the fridge for up to three weeks. 1/2 cup superfine brown rice flour, plus more for dusting. 1 teaspoon fresh thyme leaves. 1 1/2 teaspoon salt (plus more for quinoa). 6 spring onions, or two medium leeks, diced. 60 g crème fraîche, or heavy cream. 1/2 teaspoon lemon zest, finely grated. 60 g goats cheese, crumbled. Preheat the oven to 190°C / 375°F. Combine the first six ingredients in a food processor, pulsing a couple of times to aerate the ingredients. Add the olive oil and ½ cup cold water. Pulse until the dough comes together. Transfer the dough to a work surface, knead it a couple of times, and press it into a disk. Wrap in plastic wrap and refrigerate for 30 minutes. Dust a work surface with superfine brown rice flour and roll the dough to a ⅛ -inch thickness. Roll the dough carefully around the rolling pin and place it over a 9-inch square or round tart mold. Fill the mold. Pinch the cracked pieces together and trim the edges. Transfer the tart mold to the refrigerator and chill for 30 minutes. Place the tart on a baking sheet and cover it with a piece of parchment paper. Add pie weights or dry beans and blind-bake for 20 minutes. Remove the beans and the parchment and bake for another 10 minutes. Let the crust cool while preparing the filling (leave the oven on). Reduce the oven heat to 180°C / 350ºF. In a small saucepan, combine the quinoa, ½ cup water, and a pinch of salt. Bring to a boil, reduce the heat to low, cover, and cook for 15 minutes. Place the grated zucchini in a bowl and add ½ teaspoon of the salt. Transfer to a colander set on top of a bowl and let macerate for 15 minutes. This will release some of the moisture from the zucchini. Discard the water collected in the bowl. In a large sauté pan, heat the olive oil over medium heat. Add the drained zucchini and spring onions. Cook for about 5 minutes, until they soften. Add the cooked quinoa and stir. Remove from the heat and set aside. In a large bowl, whisk together the eggs, crème fraîche, remaining 1 teaspoon salt, lemon zest, and pepper. Spread the zucchini mixture over the tart crust. Pour the custard over the vegetables. Top with the crumbled goat cheese. Bake for 25 to 30 minutes, until the custard sets. Let the tart cool for 15 minutes before cutting. 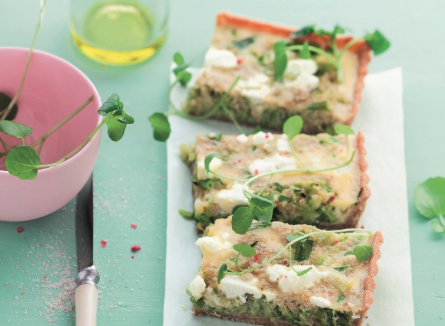 Serve warm or at room temperature garnished with the watercress. The tart can be stored in the refrigerator for up to 3 days or frozen for up to 1 month. 500 g minced pork or beef. 1 cup chopped leftover or Par-Cooked-and-Frozen Veggies. several tablespoons chopped herbs (I use sage and thyme) and/or 2 tsp dried herbs and spices (I like nutmeg)..
Preheat the oven to 180ºC / 350ºF and lightly grease a 12-cup muffin tray. Brown the mince in a frying pan with a little oil. When cooked, add in the veggies and cook until just soft. Beat the eggs in a bowl, then add the meat, veggies, cottage cheese, herbs and spices. 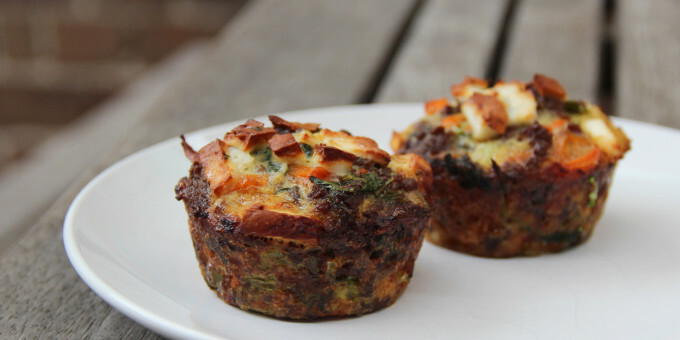 Spoon into the muffin tray and sprinkle with the grated cheese. Cook for 15-20 minutes. Best served warm. 2 1/2 cups any type of milk. figs, kiwi fruit, pomegranate, walnuts to serve. Mix all ingredients for pancakes in a bowl. Let stand for 10-20 minutes so that psyllium husk may make its binding effect. Add coconut oil to a pan on medium heat. Add 1/4 of the mixture to the pan and move pan until batter spreads out. Fry on both sides until they are golden brown and crispy. For the chocolate sauce, add ingredients into a small saucepan and mix together until combined. 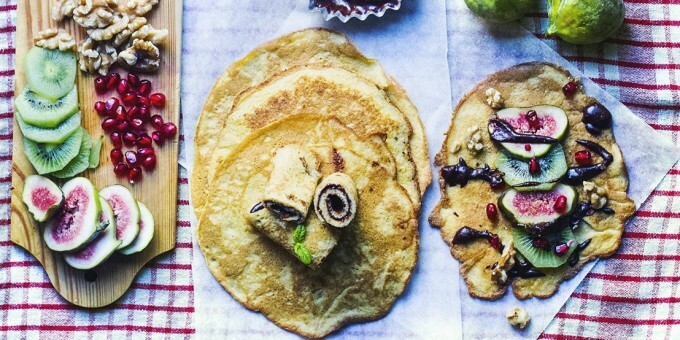 Drizzle over pancakes with fresh fruit to serve. 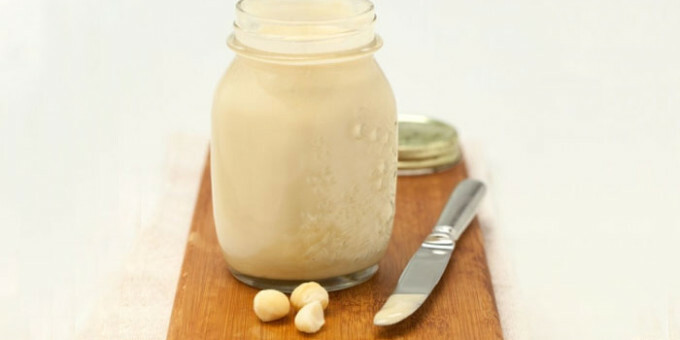 1/4 cup almond or coconut milk. ghee, butter or coconut oil, to coat skillet. 2 cups blueberries, to serve. Place all of the liquid ingredients, including the eggs in a high powered blender. Then add all the remaining ingredients except the spinach. Blend on medium for 30 seconds until well combined. Use a spatula to scrape down the sides of the blender. 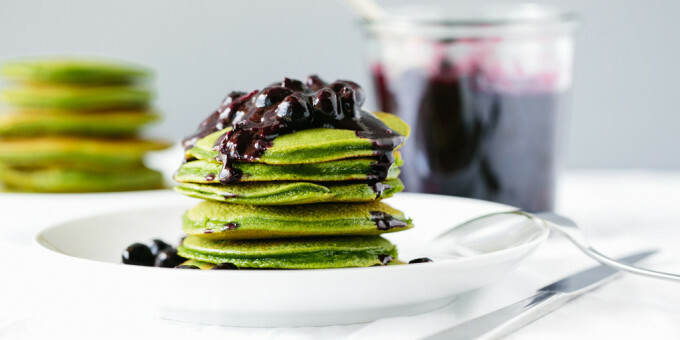 Add the spinach and blend on high until the spinach leaves are completely blended and the batter is smooth. Set aside. Heat a saucepan on medium heat and add the blueberries. Stir frequently as the blueberries heat and start to break down. Using the back side of a spoon, gently squash some of the blueberries to get more juice. Cook for 4-5 minutes or until the blueberries have become syrup-like, with a few still whole. Turn off the heat. Heat a skillet or griddle on medium-high heat and coat with ghee, butter or coconut oil. Spoon the batter onto the skillet, keeping your pancakes approximately 3-4 inches in diameter. They're much easier to flip smaller. Let them cook for 2-3 minutes on one side, then flip and cook for an additional 1-2 minutes. Serve immediately with the macerated blueberries. 2 small sourdough bread (or plain bread of choice). 1/2 lime (enough for a good squeeze of lime juice). 60 ml crumbled feta (or vegan feta: try homemade almond feta or store-bought tofu/ nut-based). 1/2- 1 teaspoon poppy seeds. 1-2 pinch dried chilli flakes. Olive oil to drizzle over. Line a baking powder with foil or baking parchment. Place the bread slices on the lined tray. Slice the nectarine half into 10-12 slices. Scoop the avocado into a bowl, add a squeeze of lime and smash it up roughly with a fork. 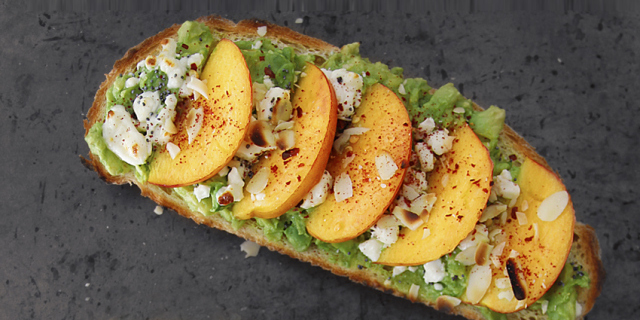 Spread the avocado over both slices of bread. Sprinkle over the poppy seeds, then the crumbled feta and almonds. Place the nectarine slices on top and sprinkle with chilli flakes. Season with salt and pepper if you wish. Pop the tray under the grill for a couple of minutes, watching to make sure that the bread is toasted but nothing burns. Remove from the grill and sprinkle sparingly with a little lingonberry powder (if desired) and drizzle over a small amount of olive oil. Serve immediately. 350g middle bacon rashers, rind removed. 1/4 cup broccoli florets, shredded finely with a knife. 1/4 cup fresh herbs, roughly chopped (coriander or basil works great). 1/4 cup frozen peas, defrosted. 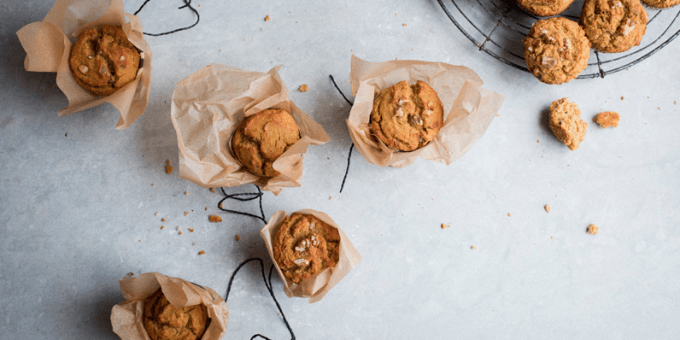 Preheat the oven to 200ºC / 400°F / Gas Mark 6 and lightly grease eight holes of a muffin tray. Use a bacon rasher to line greased cups, looping or pressing the bacon around the sides and using any small broken bits to line the bottom. It needn’t be a perfect job – feel free to use extra bits to fill in the gaps. 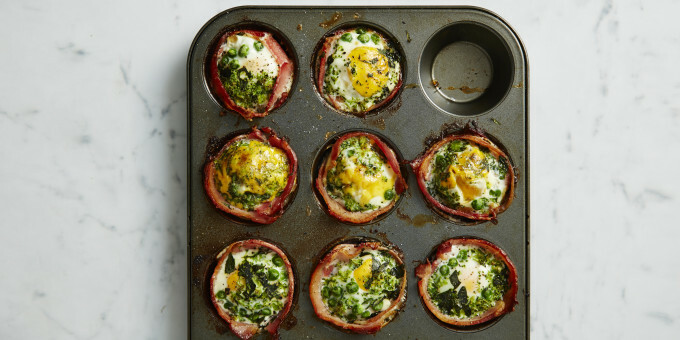 Gently crack 1 egg into each bacon cup, sprinkle herbs, broccoli florets and peas over the top and season with salt and pepper. Place in the oven and bake for 15 minutes, or until the egg whites are set. Let them sit for a minute and then, using a knife or spoon, gently remove the cupcakes from the tray. These cupcakes will last up to 6 days in a sealed container in the fridge.